The De Wintertuin residential project in the Dutch town of Weesp celebrated completion of its general refurbishment below a new, fenestrated roof. The fact that the party took place in the light-flooded atrium can also be seen as part of the plan because in terms of lighting and illumination the upgrading brought highly decisive benefits for the residents and operator of the residential project. TRILUX designed and supplied the lighting, based 100% on LED technology. Elderly people live in the residential project De Wintertuin (Dutch for 'Winter Garden') in Weesp. They live self-sufficiently in their apartments, arranged across three storeys around an inner courtyard, and this courtyard was recently subjected to a fundamental transformation. 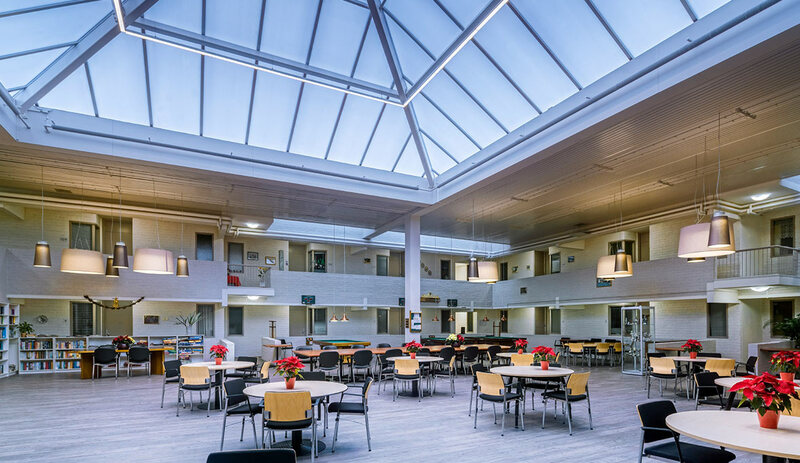 A generously-dimensioned glass roof was also installed as part of the refurbishment of the residential complex at a cost of € 2.1m. The dominant concrete-grey of the building originating from the 1970s has also been replaced by a radiant white. Not only the inner courtyard but also the other public areas now appear significantly larger and friendlier. This effect was created on the one hand by the generous quantity of daylight in the building, and on the other De Wintertuin now has a bright and spacious appearance on grey days and during twilight hours, when LED luminaires create appropriate illuminance levels for a pleasant atmosphere. 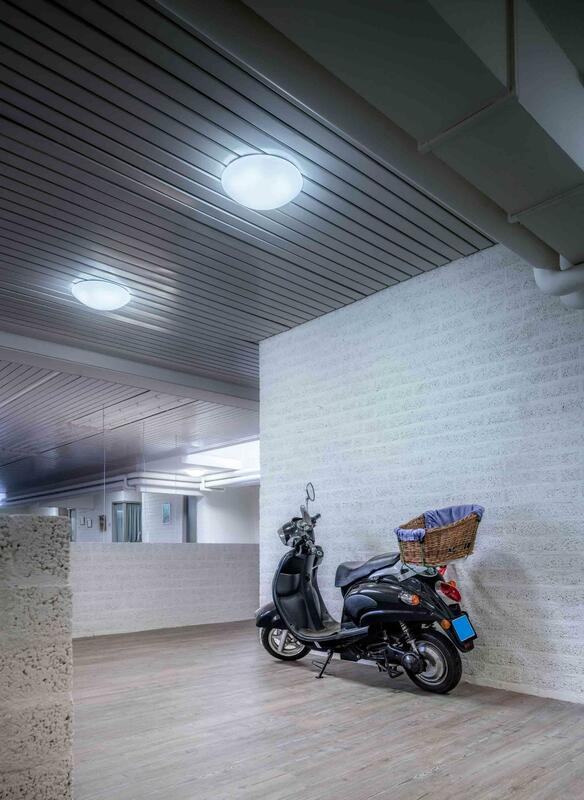 Various products from the TRILUX luminaire portfolio were installed in the residential complex, with around 170 round surface-mounted luminaires from the 74 LED series illuminating the hallways in the building. Other functional areas were equipped with Aragon LED weather-proof luminaires and Amatris LED recessed downlights. The LED luminaire 7402 is installed in the corridors and stairways. 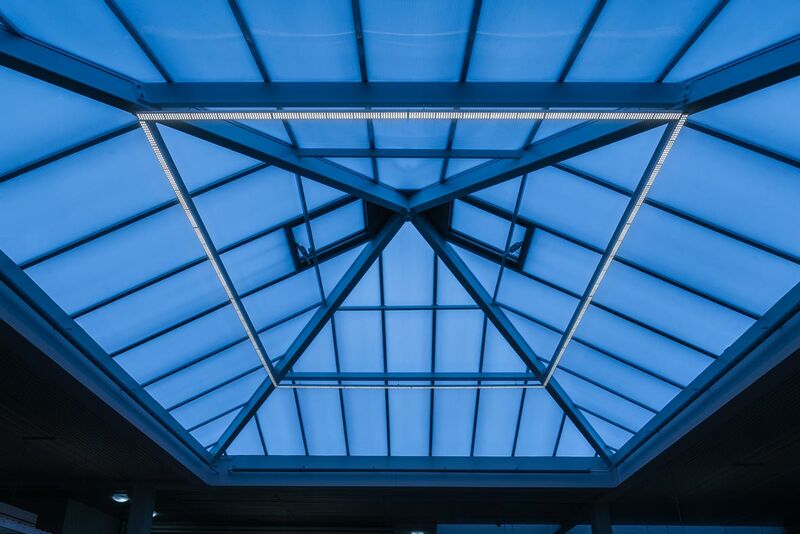 The square lighting structure below the fenestrated roof in the atrium consists of 16 modules from the E-Line LED rapid-mount system. Large pendant luminaires with fabric shades also set decorative accents. The Milano, Cassano and Taro from Oktalite are ample proof as to how the product rangesfrom individual members of the TRILUX Group can be beneficially combined in projects. 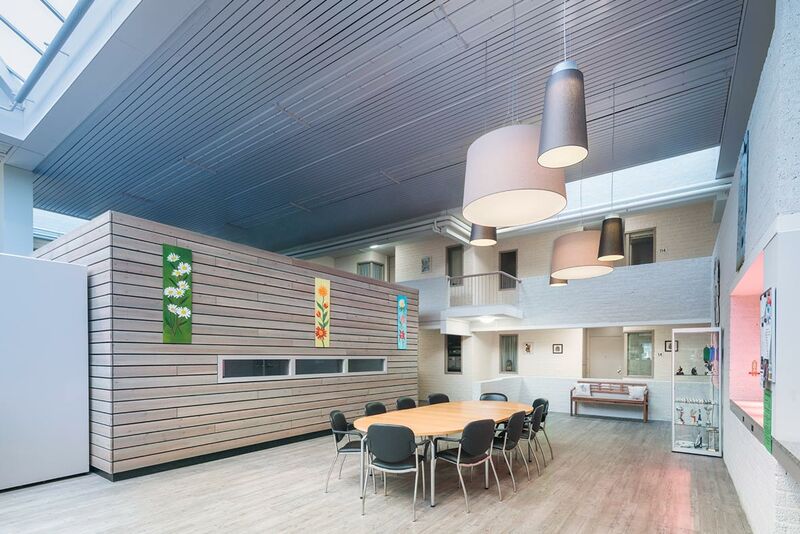 While the De Wintertuin residents are pleased about improved visual conditions in the building and the attractive looks of the new luminaires, the system also achieves very significant cost savings for the operator. TRILUX implemented a solution consisting entirely of LED technology – still not an everyday decision for a project of this size and for residential purposes. The significantly lower wattage connection values compared to the obsolete lighting system tangibly reduce energy consumption. Lighting control enables further savings: the luminaires can be dimmed via DALI according to the amount of daylight. In total TRILUX lighting designers calculated energy savings of up to 70% for the De Wintertuin lighting installation. Thanks to this cost reduction, the investment for the new system will pay back within the next two years. TRILUX luminaires are used in the public usage areas of the residential project. High heights and extensive configurations: no problem at all for the E-Line LED system.